I believe that circumstances put events in motion. For example, for years I toyed with the idea of being a writer. I dabbled here and there, popping out poems, writing short stories, taking a few workshops, but I didn’t make a true attempt until I was diagnosed with arthritis. I realized life doesn’t stop or offer very many second chances, so I decided to make the most of my time – it was now or never. I’m confident at some time I would have settled down to pursue my dream, but I believe the onset of my disease urged me into action. The cause and effect in life is what makes living a stimulating challenge. A few weeks ago, I wrote about how I have not had a cold in four years. I was both pleased and amazed at this stroke of luck, but as luck would have it, my luck ran out. Two weeks after writing that post I was walloped with a doozy of a cold. Congestion, cough, aches, fever, the whole nine yards, categorically shattering my four-year record in one fell swoop. I wouldn’t say I challenged karma, but I must have irked it a little – kind of like poking a bear with a stick. I began the usual regime to fight the virus. Tissue boxes camped out beside my bed with various cold medications, hot toddies, heating blankets, fuzzy pajamas and chicken soup. I decided that if I had to suffer from this beastly bug, then I was going suffer in as much comfort as possible. A couple of days went by and although I was down and out, I assumed I had it all under control…and then along came the unrivalled RA flare. My immune system being further compromised it was only fitting that my arthritis would jump on the bandwagon. Along with my congestion, I was now beleaguered with sore swollen joints puffing me up like blowfish. 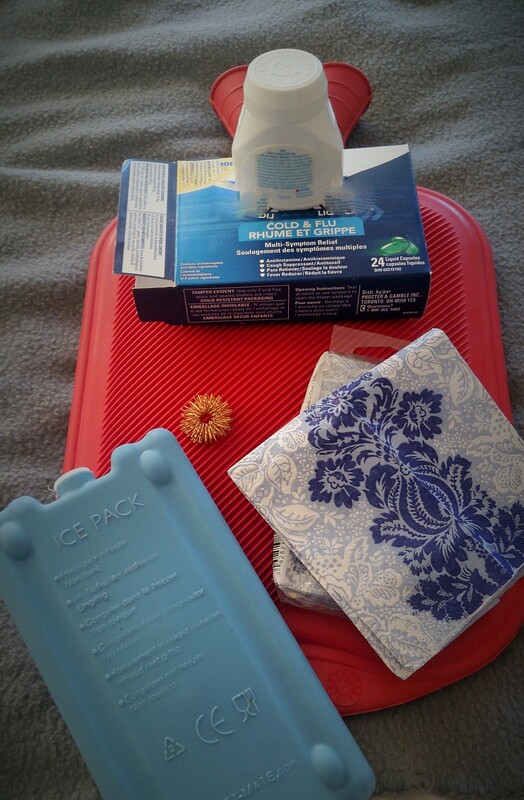 I pulled out the ice packs, the hot water, bottles, the acupressure rings, the NSAIDs, anything I could think of to prepare for battle. I lay in bed with all the comforts of home surrounding me thinking I had got the worst of it….until the regular monthly visitor made its appearance. There was no denying it – this all added up to a phenomena aptly coined by my better half as C.R.A.P – cold, RA and period. I’m sorry you’re feeling so crummy but I can help LOL!! Funny about hardly ever having a cold; hope that you are feeling better now. Four years is a looong time to remain free of the nasty cold virus. I hardly ever get “colds;” always get the flu vaccine. Do you think it helps? Hi Lynne, I had been lucky to avoid a cold for a long while – until recently 🙂 I think the flu vaccine does help in that it keeps the spread of infection down; I don’t think its always a guarantee, but if it’s always worked for you in keeping you relatively healthy, than perhaps there’s something to it. Hope all is well. Cheers. C.R.A.P – I love it! I haven’t had a cold n years either and after opting out of flu shot yet again, feared karma would bite me back. So far, so good. Holding breath. Here’s hoping karma completely overlooks you in terms of the flu… maybe it can bring in the good stuff instead 😉 Stay well. Cheers.